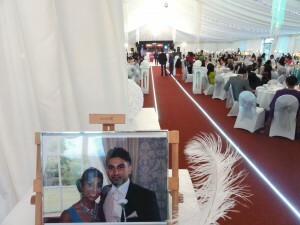 Asha and Vijay celebrated their wedding in the beautiful Lakeview Marquee in Fairlop waters. The marquee has some very nice new touches since the last time we have performed here including the LED walkway and the very majestic looking chandeliers which are placed around the marquee. We joined the couple for the ‘Grand Entrance’; there were some very joyous and delighted family members who joined in from their respective tables into the walkway with dancing and cheering while we made our way down to the dancefloor, which made this a very memorable bride and groom entrance. While guests enjoyed some starters provided by the in house Lakeview caterers, the couple took their position for their first dance as husband and wife. 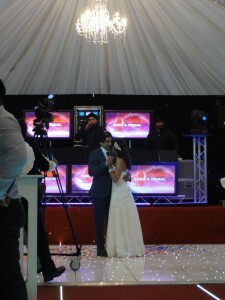 After the main course had been enjoyed by guests, DJ Vix (Dhol and Bass Roadshow) opened up the dancefloor and entertained guests all the way into the early part of the night. 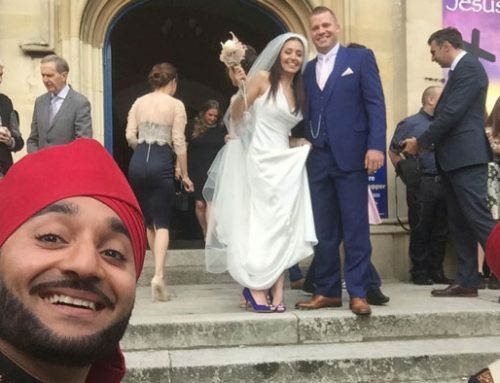 A lovely Lakeview wedding!